These years we've assumed fingerprint evidence was infallible. 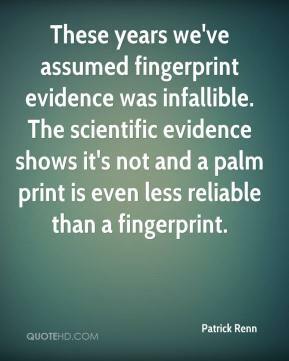 The scientific evidence shows it's not and a palm print is even less reliable than a fingerprint. It is a breach of faith. 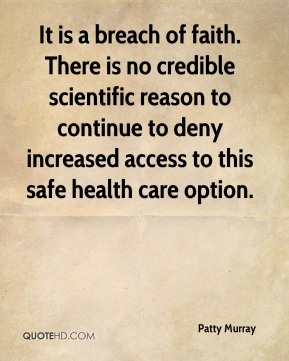 There is no credible scientific reason to continue to deny increased access to this safe health care option. 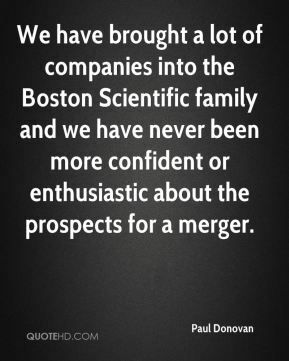 We have brought a lot of companies into the Boston Scientific family and we have never been more confident or enthusiastic about the prospects for a merger. We will concentrate our actions on scientific bases. 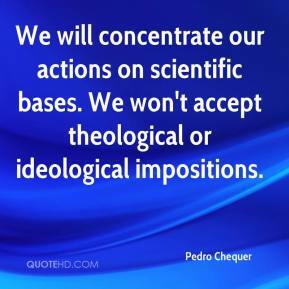 We won't accept theological or ideological impositions. 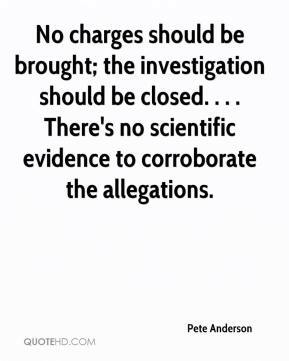 No charges should be brought; the investigation should be closed. . . . 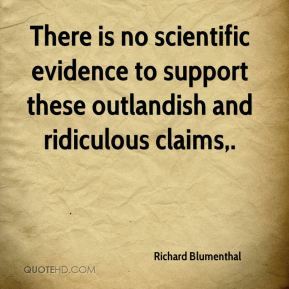 There's no scientific evidence to corroborate the allegations. 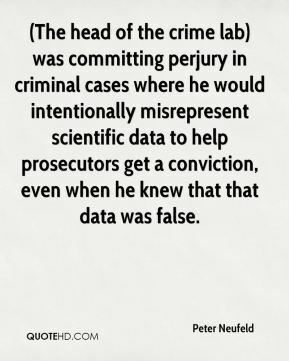 (The head of the crime lab) was committing perjury in criminal cases where he would intentionally misrepresent scientific data to help prosecutors get a conviction, even when he knew that that data was false. 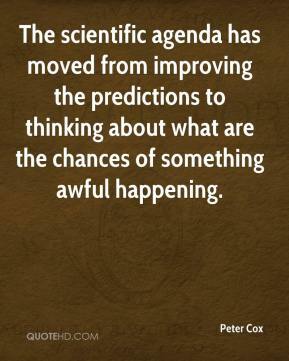 The scientific agenda has moved from improving the predictions to thinking about what are the chances of something awful happening. Now that we have this scientific, objective measure of pain, we'll be able to assess pain-relieving therapies much more precisely. It is certainly something we need to be aware of. 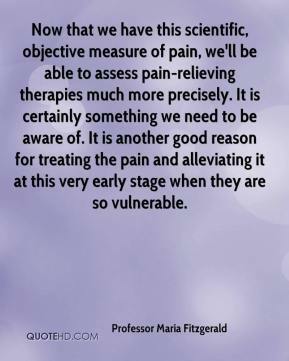 It is another good reason for treating the pain and alleviating it at this very early stage when they are so vulnerable. 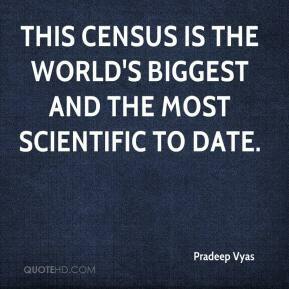 This census is the world's biggest and the most scientific to date. Scientific knowledge brought into being ever more wonders. The legends of my ancestors were shamed into silence. No longer did one have to meditate for years to be able to speak with someone across the sea. Some Germans had stretched a sea-cable from England to India! And wires of this sort were proliferating from here to there all across the face of the earth. Now the whole world could observe the actions of a single person. 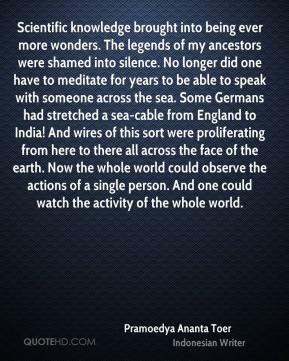 And one could watch the activity of the whole world. 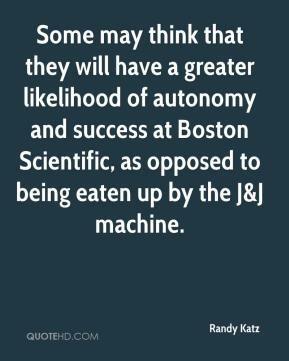 Some may think that they will have a greater likelihood of autonomy and success at Boston Scientific, as opposed to being eaten up by the J&J machine. 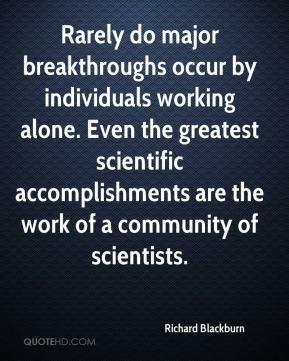 Rarely do major breakthroughs occur by individuals working alone. Even the greatest scientific accomplishments are the work of a community of scientists. 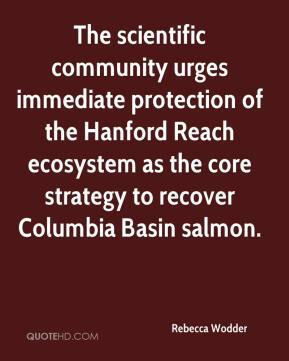 The scientific community urges immediate protection of the Hanford Reach ecosystem as the core strategy to recover Columbia Basin salmon. 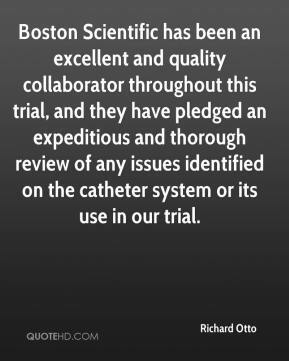 Boston Scientific has been an excellent and quality collaborator throughout this trial, and they have pledged an expeditious and thorough review of any issues identified on the catheter system or its use in our trial. We attach very, very, very, very much importance to open source software. In this nation we consider artistic and scientific creation key, so we want to protect small companies that create and service open-source software. There is no scientific evidence to support these outlandish and ridiculous claims. 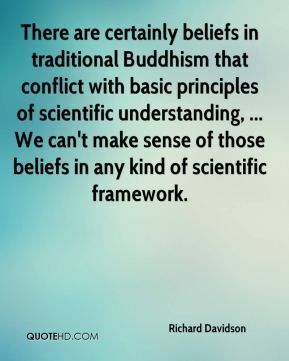 There are certainly beliefs in traditional Buddhism that conflict with basic principles of scientific understanding, ... We can't make sense of those beliefs in any kind of scientific framework. 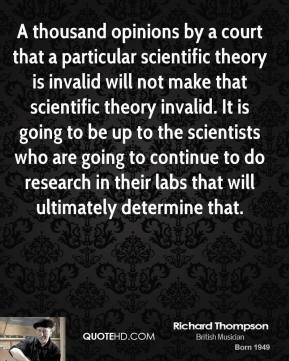 A thousand opinions by a court that a particular scientific theory is invalid will not make that scientific theory invalid. It is going to be up to the scientists who are going to continue to do research in their labs that will ultimately determine that. 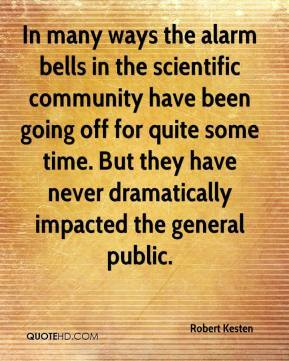 In many ways the alarm bells in the scientific community have been going off for quite some time. But they have never dramatically impacted the general public. 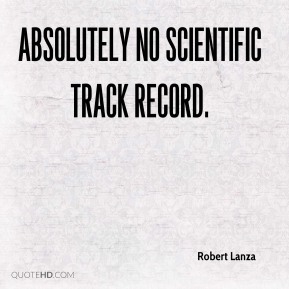 absolutely no scientific track record. This isn't a scare tactic. 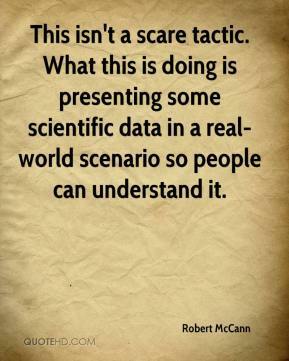 What this is doing is presenting some scientific data in a real-world scenario so people can understand it. It was obvious. You'd have to be blind not to recognize it. 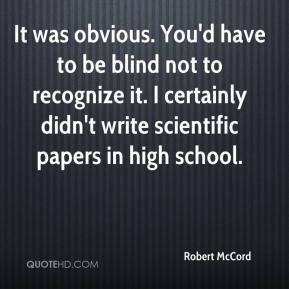 I certainly didn't write scientific papers in high school. 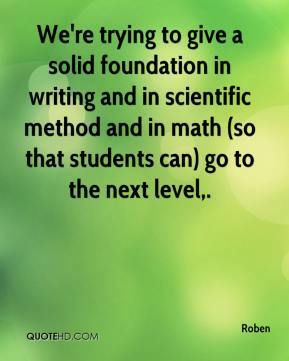 We're trying to give a solid foundation in writing and in scientific method and in math (so that students can) go to the next level. 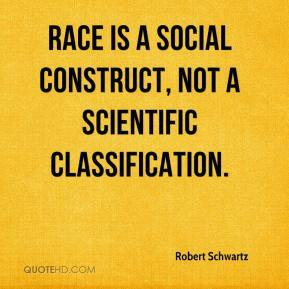 Race is a social construct, not a scientific classification. 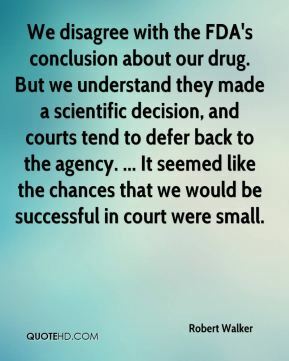 We disagree with the FDA's conclusion about our drug. But we understand they made a scientific decision, and courts tend to defer back to the agency. ... It seemed like the chances that we would be successful in court were small.